1700oC, 1500oC Tubular, 2000oC and 10-5 torr vacuum furnaces and oven (50-200oC) with control atmospheres. Aqueous Colloidal Shaping of Ceramics possesses significant advantages over compaction techniques in terms of minimized processing defects, complex shaping and microstructural control. ARCI has therefore, established a gel/slip casting laboratory and complex shaped alumina samples are developed. The lab contains processing equipments like ultrasonic processor, attrition mill, ball mill for the preparation of slurry. The high temperature oven with the options of inert gases/ Forming gas/ Air circulation is used for drying or curing all sort of functional coatings / materials in a large scale. It is one of the Unique facility in India. All types of dense non-oxide ceramic can be developed. Larger component (10" x 12") can be produced. Theoretical density can be achieved for non-oxide ceramic at less temperature. High temperature Vacuum Oven is used for drying or curing of all sort of functional coatings / materials under vacuum. It is widely applied in solar PV, Solar thermal and other applications for nanostructure material and coating developments. The vacuum sintering furnace is used for both pre-sintering operation to burn out the binder through the inclinator and for final sintering. This is the largest high temperature vacuum sintering furnace available in India. Provides Excellent temperature uniformity (Â� 1oC) and the maximum component size can be sintered upto is 1.2 M.
This multi-purpose furnace has wide range of options to carry out heat treatment, powder sintering and annealing under high (10^-6 torr) vacuum and up to 1-3 psig positive pressure of argon, nitrogen or hydrogen atmosphere. The system can be operated at high temperature up to 2000 degree C. The system is equipped with forced gas quenching setup for rapid cooling of the charge/sample(s) under inert gas within the furnace chamber after completion of the heat treatment. The system is fully automated with PLC control and has remote operation capability. This uni-axial hydraulic press is used for making ceramic and powder metallurgy compacts. This hydraulic press is custom built to make specific non-oxide ceramic parts for critical application. It has got vast day-light with adjustable ram speed movement to achieve good compacts. In addition to that, the press also has ejector with moving table for the removal of compacted parts from the die body. Hot isostatic press applies both pressure and temperature to form and uniformly densify a particular material. Pressure is applied inside a vessel by compressing a gas medium, such as argon while the heat is supplied through a resistance-heated furnace, also located inside the pressure vessel. Temperature and pressure are monitored and controlled within a specified tolerance throughout the process, and a computer provides man/machine interfacing. Density near to theoretical density can be achieved. Press has a day light of 800 mm with a table size of 750 mm x 750 mm. The hydraulic press used for consolidation of powders. For the consolidation of advanced ceramic components. Double action mechanical presses with floating die mechanism, withdrawal type ejection and pneumatic core shooting facility. The machine is fully automated. Tool post available for multi-level compaction (max. 5 levels). It can be used for metallic and ceramic powder compaction. Maximum working temperature of the furnace is 1200oC. 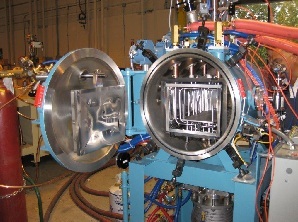 Muffle furnace features five side heating zone for the uniform thermal treatment of large area solar cell electrodes. PLC controller with over-temperature protection system enables long sintering cycle. Provisions are available for feeding reactive and inert gases. Capacity of each piston, T:	3 max. The advantage of the above hot press is that it works on both laboratory scale as well as pilot level. The split hood deign of the muffle enables faster cooling and batch completion time. The pistons being independently operating allows different pressure conditions to be set simultaneously, facilitating less no. of cycles for different experimental conditions. The furnace has been designed such that power consumption is very minimal and can be operated with either 100 % hydrogen, or nitrogen flowing gases unlike conventional hot presses which are designed for either inert or vacuum. Thus metallic, cerametallic or even polymer based samples can be processed. Capacity of 2-5 kg/h of water evaporation. Spray drying is a widely applied method to dry aqueous or organic solutions or suspensions, emulsions to a solid powder to increase the apparent density of the powder, to increase flowbility and volume reduction. The aqueous slurry of the powder is fed through a nozzle to atomize in a hot chamber and subsequently dry it into granules. The size (10-60 Â�m) of the powder granules can be varied by changing feeding rate, slurry concentration, chamber temperature and nozzle type etc. Drying air flow: 35 - 40 m3/h. Spray drying process is to dry aqueous or organic slurries involving the steps of feeding the slurry solution with Peristaltic Pump followed by dispersion with spray nozzle, evaporation with drying cylinder and separation granules with cyclone/fitter. The equipment is used to carry out high energy milling of powders. As the mill imparts high kinetic energy to the powder through balls, the process takes short time there by eliminating contamination of the material being processed. The mill is used to produce nano-structured materials, non-equilibrium compositions and dispersion of oxides and carbon nano tubes in metals/alloys.